It was the criminal case that kept the whole Japanese nation in suspense: In 1989 the 7-year-old schoolgirl Shoko disappeared near Tokyo and her parents later got a phone call from her kidnapper who demanded a ransom of 20 million yen. The girl’s parents did pay the ransom but nonetheless the child’s corpse was discovered short after the handover of the money. Even though the Tokyo police was involved during the whole kidnapping they still haven’t been able to get on to the track of the abductor so that the identity of Shoko’s murderer remained unknown. When I first discovered Hideo Yokoyama’s crime novel „Six Four“ there were two things that immediately made me want to read it: The first thing was that it came with the praise of being „the Japanese crime sensation that sold over a million copies“ which even for a nation with a population of 128 million people is still quite impressive and I really don’t get to read of lot of crime novels or thrillers that are set in Asia. But what made me even more excited about the book was the fact that it was teased with the line „The twist no reader could predict“ and you can always bait me with the prospect of a shocking or mind-blowing plot twist. But before you get to know about the big revelation there’s still a lot of work lying ahead of you because „Six Four“ is not only 600 pages long but also requires some effort to work yourself into the story. That’s mostly because Hideo Yokoyama’s novel is different than most of the other books in this genre, starting with the fact that there’s not really a case that needs to be investigated since the protagonist Mikami isn’t a real detective anymore but got against his will transferred from Criminal Investigations to the Administrative affairs department of his prefecture so that he has to deal with media relations instead of actual police work. For Mikami this means that he has to get involved with sensationalist and ruthless reporters instead of experiencing the thrill of catching criminals, for the readers it means that there’s not the kind of investigation that one might be used to: there are no questionings of witnesses, no interrogations of suspects, no analyses of pieces of evidence and most of the story takes places inside the police department complex. This might appear a bit weird when there’s such a big case as the Six Four kidnapping (the name derives from the fact that it took place in the 64th year of the rule of the Japanese Emperor Showa) but even though Yokoyama’s novel lacks most of the elements of a typical crime novel it’s far away from boring, even though the book might indeed drive some readers away with its very slow pace. I admit that it’s a bit difficult to find into the story not only because of the very slow pace but also because Western readers might have a bit of a hard time keeping track of all the different names since most of them sound very similar, for example there’s Mikami (the main character and „investigator“), Minako (his wife), Mikumo (his colleague), Mizuki (a friend of his wife) and Matsuoka (his superior) and it took me quite a long time until I didn’t confuse them with each other anymore. So this novel requires a lot of concentration and patience, especially for the first 200 pages that serve mainly as a introduction and make you familiar with the protagonist, the Six Four case and the structure of the Japanese police force. It definitely helps to think of „the twist no reader could predict“ in this phase as some kind of motivation and even though not a lot is actually happening Hideo Yokoyama succeeds in creating a feeling that there is this one big secret that needs to be unravelled and you always have a feeling that there’s something really huge going on behind the scenes. 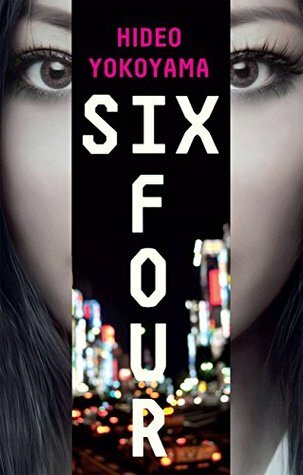 So once you’ve digged yourself into the story it just doesn’t let you go anymore and you’re beginning to feel like an old detective that had this one special case he could never solve and which haunted him for all his career and Six Four is exactly that kind of case. I’m saying this again because it’s important not to face „Six Four“ with the wrong expectations: for most of the time there is no actual investigation going on and Mikami is dealing mostly with three different problems: can he make the police commissioner’s visit to the victim’s family happen against all obstacles? Can he calm down the press who is attacking Administrative affairs about the car accident of a pregnant woman that seriously injured an old man (which is not even „Six Four“-related)? And last but maybe most important for Mikami: can he find out about the whereabouts of his own daughter who ran away from home months ago? It’s really fascinating how most of the time the kidnapping itself isn’t really part of the story but how it’s still very difficult to put the book down once you’ve arrived in the story. And of course there’s also this big plot twist that has been so prominently advertised and let me assure you that it doesn’t disappoint. I have conjectured the wildest things and the most unlikely developments but still haven’t been able to even remotely see THIS revelation coming – and the best thing about it is that even though it’s so completely unpredictable it seems totally believable and not even farfetched. In my opinion the plot twist alone is worth fighting through the 600 pages even though the ending is not 100% satisfying because some essential questions remain unanswered. Don’t worry, this book doesn’t leave you with an open ending and the most important part of the big secret is revealed but there are still some loose ends that Hideo Yokoyama leaves up to the readers’ interpretation which can definitely be a bit disappointing but somehow also fits to the character of the story. 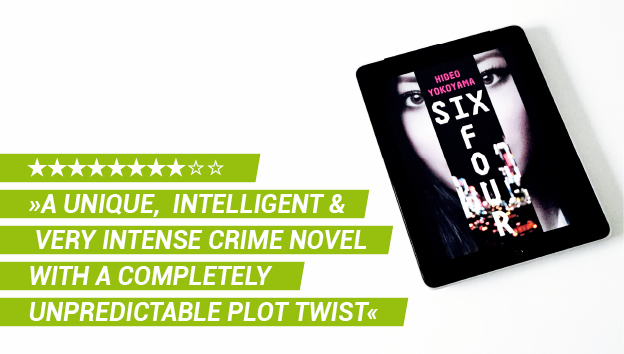 So if you’ve read through all this and the prospect of a slow-paced mystery with a long introductory phase and quite a lot of internal police politics instead of an actual criminal case investigation didn’t scare you away then there’s a good chance that Hideo Yokoyama’s „Six Four“ might thrill you as much as it did me. I definitely wouldn’t recommend this book to every crime fan because it’s so different than any other crime novel I’ve read before but if you’re looking for an intelligent story with quite a unique atmosphere then you should give this one a try. It might be challenging at times but when you’re in the middle of a press conference where the reporters are almost turning into a lynch mob or when you’re sitting in a surveillance car and get a minutely detailed account of the stages of a kidnapping then there’s so much tension that it almost makes you stop breathing and scenes like this are what made all the efforts so worthwhile. Hideo Yokoyama’s „Six Four“ is far away from being an ordinary crime novel and on the surface might appear a bit boring first because it lacks most of the typical elements like an actual investigation, interrogations or the analysis of evidence and might require some concentration and patience at times but once you’ve fought your way into the story it creates such a tense atmosphere that this story won’t let you go anymore – and the completely unpredictable plot twist alone is already worth all effort. I’m really glad you convinced me to read this! That plot twist was more than worth the first part of the book, which really wasn’t that bad. It was at least interesting to see the differences and similarities between how the police operates in Japan vs. in the novels/shows I’m used to. I looked at Goodreads, but I didn’t see any other Yokoyama novels that have been translated into English. I would definitely read his next book!